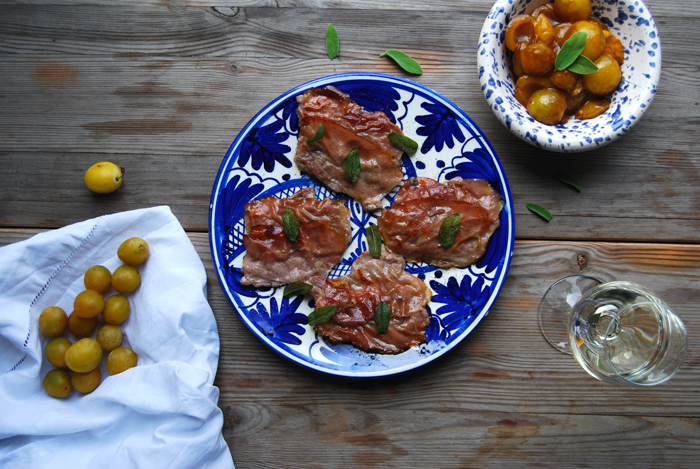 This meal combines two wonderful dishes, Saltimbocca alla Romana and mirabelle compote! Both are very high on my list of summer favourites. Let’s start with the “Roman schnitzel”, the saltimbocca, or Salt’ im bocca! in the Roman dialect. It means Jump in the mouth! and that’s how I feel when I have a plate of these little escalopes in front of me. 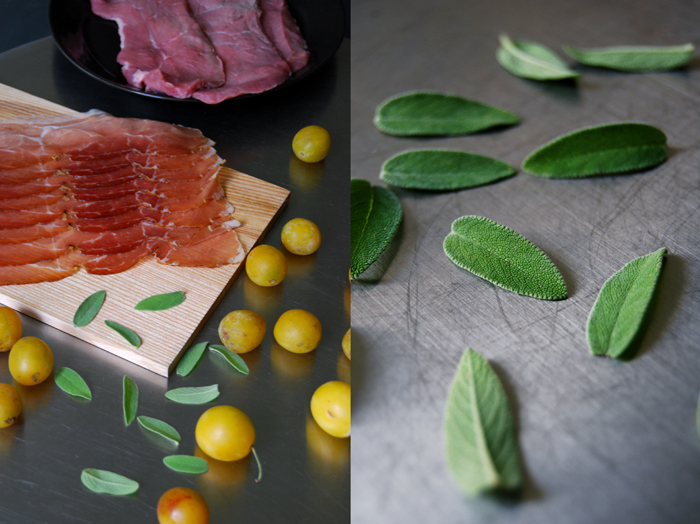 The combination of veal, smoky, salty prosciutto and aromatic sage is so perfect that the first bite of it explains why this dish became so famous all over the world! There are different approaches to the preparation, some like to roll them, fold them just once or keep them flat like a schnitzel. This is how I prefer them, but the composition of the three flavours, veal, prosciutto and sage, always stays the same. Some recipes recommend Coppa di Parma but my favourite is thinly cut Tyrolean prosciutto with the right balance of smokiness and saltiness. To me, late summer is the time for fruits, peaches, plums, figs, berries and mirabelles. 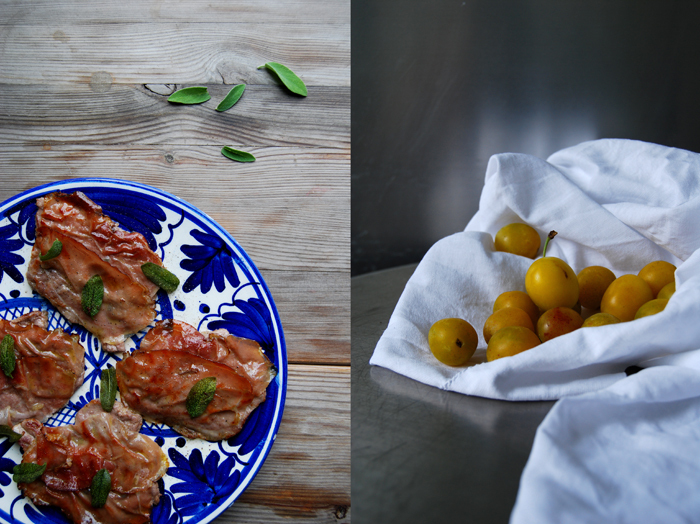 Sometimes I cook some carrot slices to serve with my saltimbocca, still crunchy and sweetened with honey and basil. 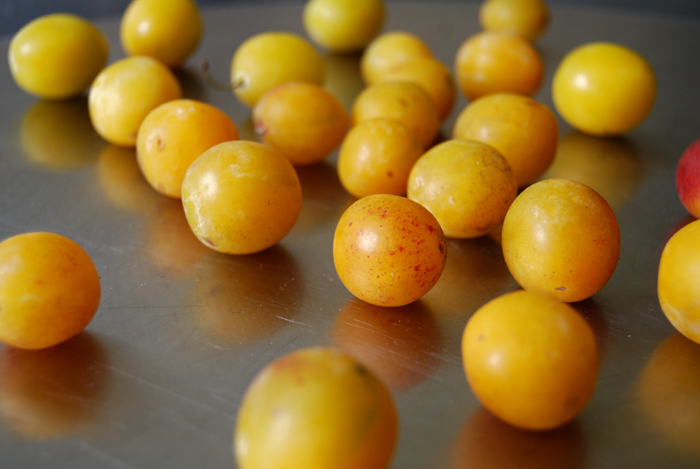 However, at this time of the year I prefer fruit for some of my savory dishes, like sweet mirabelles ripened under the sun of Tuscany. When we used to go on holiday close to Florence as a child, I fell in love with a mirabelle tree next to the house and its tasty crop! I could eat buckets of them! They’re at the peak of their season at the moment and I buy them every week as long as I can get them at the market. I love them, when they are ripe and golden they are sweeter than plums, a bit like honey. They make a wonderful compote too. I cook them for just 1 minute as I don’t like to turn them into a mousse, I leave them chunky. 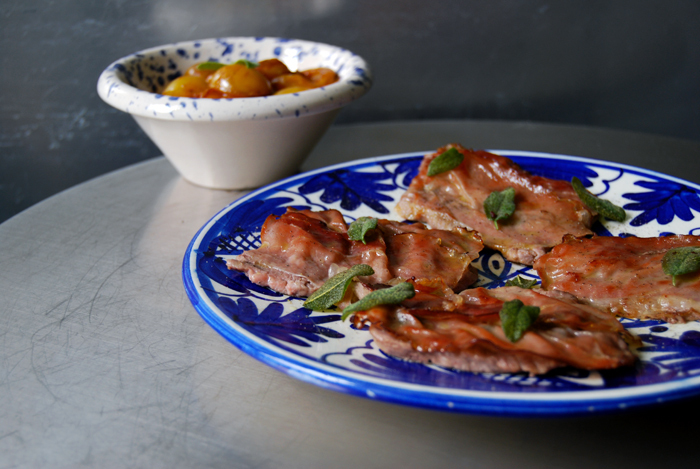 I refine the compote with some Balsamic vinegar and a little cinnamon, it’s delicious together with the saltimbocca! Place the escalopes between clingfilm and flatten them with your fist until they are around 5mm / 1/4″ thick and season lightly with pepper (no salt as the prosciutto adds enough saltiness). Dust one side with flour, put 3 sage leaves on the other side and cover them with a slice of prosciutto, pressing it onto the meat. In a large heavy pan, heat a splash of olive oil and 1 tablespoon of butter and fry the escalopes (start with the side with the prosciutto) together with the remaining sage leaves for about 1 – 1 1/2 minutes on each side on high-medium temperature. Move the meat and sage to a plate, add 1 tablespoon of butter and a splash of the marsala, simmer the sauce for 30 seconds and take off the heat. 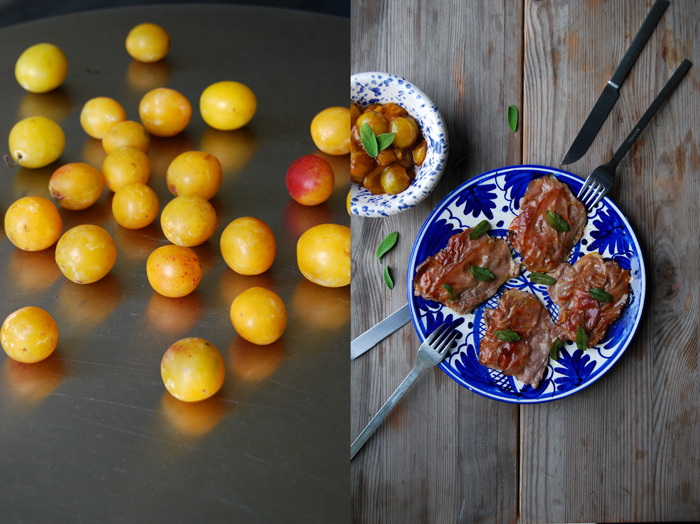 Serve the escalopes with the sauce, crisp sage and mirabelle compote. In a sauce pan, bring the ingredients to the boil, close with a lid and cook for 1 minute medium heat. Season with vinegar, sugar and cinnamon to taste. Incredibly good, the different flavors add to a heavenly composition. What a perfect match. Thank you for sharing that awesome recipe, Meike. 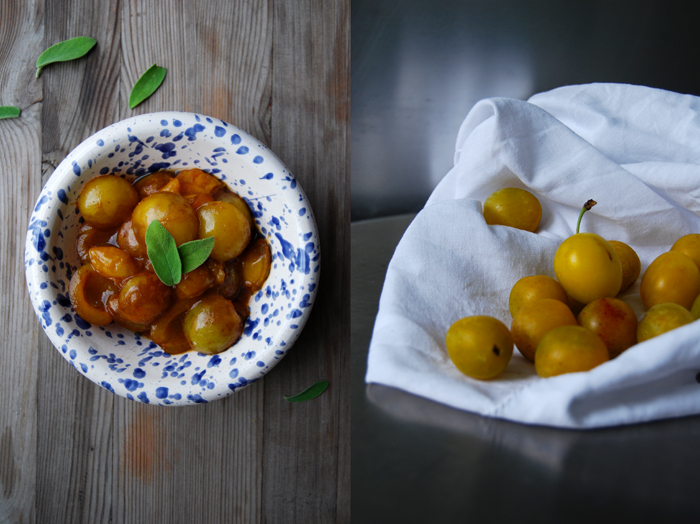 And I think I will add balsamico to the Mirabelle compote on other occasions as well. Luckily there are many more in our garden waiting to be harvested. 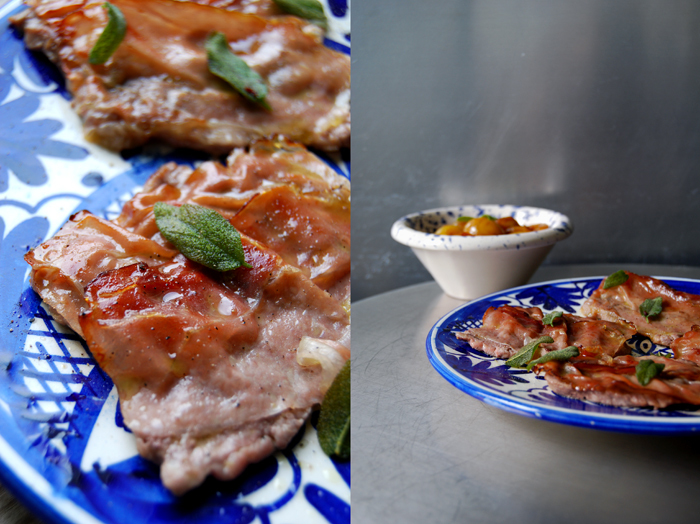 Love saltimbocca…I live in cattle country, but it is next to impossible to find veal in my area…I have to drive at least 60 miles to find it! Your photos are wonderful, Meike.